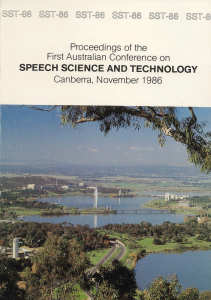 The 16th Australasian International Conference on Speech Science and Technology (SST2016) marks the 30-year anniversary of the first SST conference hosted by ANU in Canberra in 1986. The SST-86 conference was a pivotal point for the Speech Science and Technology community in Australia and its recognition internationally. Two eminent keynote speakers (Professor John Laver – University of Edinburgh; Professor Louis Pols – University of Amsterdam) provided an external stamp of quality alongside the burgeoning work arising from the 20-30 local research groups. The SST-86 contributions included 58 papers, 6 of which were from international researchers. SST-86 was later recognised as an “international first” for the field (quickly to be followed by the Europeans with ‘Eurospeech’ in 1987 (now incorporated into ‘Interspeech’.). ASSTA (the Australian Speech Science and Technology Association, later in 2005 to become the Australasian Speech Science and Technology Association) Inc was formed in December 1988 at the second SST conference hosted by Macquarie in Sydney. SST participation rose to 68 (17 international). An initial ASSTA membership of about 80 people paid $1 each to join and the financial assets of the community largely associated with the mounting of SST-86 and SST-88 were transferred from university holding accounts to ASSTA Inc. An executive of five has been active since that time, initially elected biennially, but since 1994, annually. This 1988 seminal executive consisted of Michael Wagner (President), Bruce Millar (Secretary), Peter Blamey (Treasurer), John Clark, and John Ingram. Over the years the executive has spawned many activities designed to stimulate involvement in the aims of the Association. 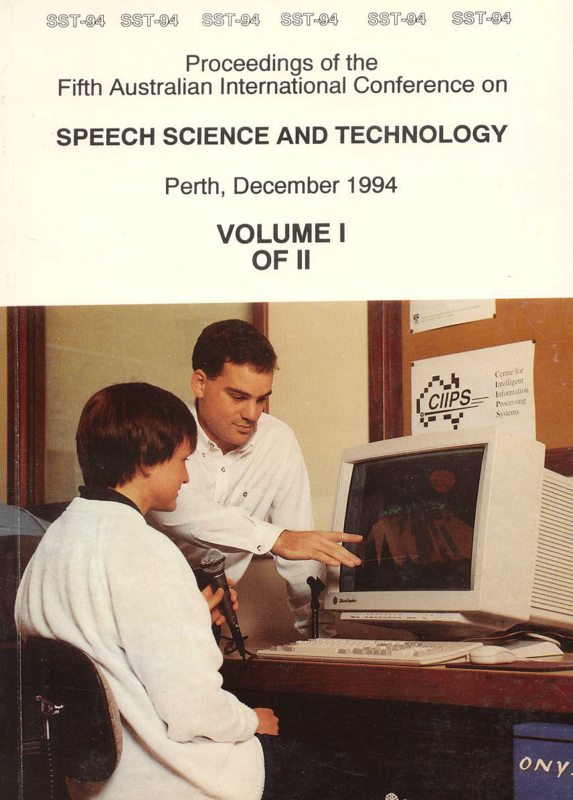 An example was that in 1992 members were encouraged to lobby the ARC to support the development of an Australian English Spoken Data Corpus. As a result the ANDOSL project was born and the products of that project have been distributed to many Australian and some overseas research groups. ANDOSL was followed in 2011 by the ASSTA-supported and ARC-funded AusTalk, an auditory-visual database of 3 hours of speech in different formal and more spontaneous contexts by close to 1,000 adult Australian English speakers from 17 locations around Australia; and the ASSTA-supported and NeCTAR-funded Alveo Virtual Laboratory in which AusTalk and many other speech and language databases are stored along with tools by which to operate on the data. The Association has gained international recognition owing to its early emergence relative to other parts of the world and to its very active biennial SST conference series attracting international keynote speakers and delegates. Further recognition has been strengthened by ASSTA’s involvement in hosting international conferences in Australia. In 1994 the vision for ASSTA Inc to bid for a major international conference was adopted by the ASSTA executive. The bid to run ICSLP-98 was successful against strong competition from Japan and Korea. A triumverate of Peter Blamey, Bruce Millar, and Julie Vonwiller steered the process with strong support in the final year from a wide group of individual members. Following a very successful conference which is still being talked about in international circles as one of the best, the ASSTA executive funded many initiatives to encourage Australian involvement in the international domain and to encourage students and young researchers into the field. 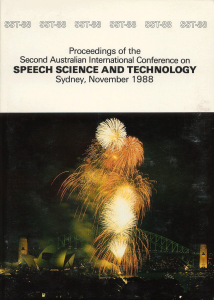 Further the executive cast a vision for Australia to aim to host such a conference approximately every 10 years. 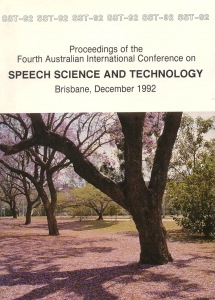 An unsuccessful bid to host the 2007 International Congress on Phonetic Sciences was followed by a successful bid to host the 2008 International Conference of Spoken Language Processing fulfilling the vision cast some 10 years before. Chair Denis Burnham and a committee of David Grayden, Michael Wagner, Andy Butcher, Janet Fletcher, Debbie Loakes, John Ingram, Roland Goecke, Catherine Best, Anne Cutler, and Mel Gallagher ran a very successful conference in Brisbane. The ASSTA 10-year vision for international conferences has been fulfilled again by the successful bid by Marija Tabain (along with her co-chairs Paola Escudero and Sasha Calhoun) to host the 2019 International Congress on Phonetic Sciences in Melbourne. -Adapted from “ASSTA History and Prehistory – a personal view”, by Bruce Millar. More information can also be found here.